Indeed, personal training is one of the few professions to not only blossom during a recession but also grow afterwards as people turn to it for a second job and even a second career. And it’s easier than ever to get certified: You can go online, take a course and start training clients within a month. “The problem is separating the accredited and qualified ones from the pretend ones,” says Scott Schreuder, chairman of Register of Exercise Professionals South Africa, a body that recognises certain qualifications and ensures exercise professionals meet the health and fitness industry standard. “Try using dumbbells, do incline presses or switch to push-ups.” Changing your grip, angle or movement pattern alters the load and positioning of your joints, allowing you to build muscle without breaking your body. Better move: Do stability exercises. 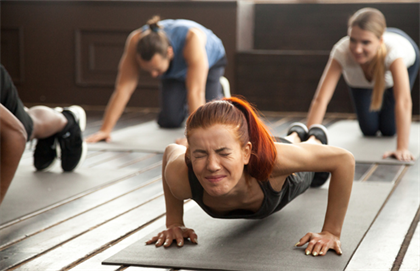 “Stability, or resisting unwanted motion, is the true function of your core, and exercises that reinforce that function protect your spine,” says Gentilcore. Try the stability ball rollout: Sit on your knees in front of a stability ball and place your forearms and fists on the ball. Slowly roll the ball forward, straightening your arms and extending your body as far as you can without allowing your lower back to “collapse”. Use your abdominal muscles to pull the ball back to the starting position. “We’re starting to see a lot of people getting thrown into an extreme group workout with little instruction, and then doing high reps of very technical lifts as fast as they can,” says Chris Bathke, owner of Elemental Fitness Lab. “Even athletes don’t do that.” When speed is your main focus, you lose sight of form and that can lead to injury – especially if you’re doing heavy Olympic lifts or powerlifting moves like cleans, snatches and dead lifts. 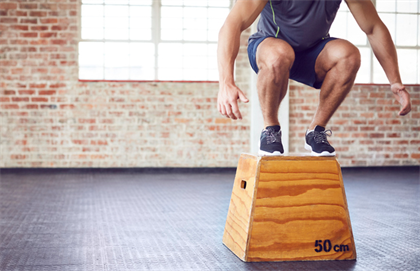 High-impact plyometric exercises, such as box jumps (leaping on and off a box or bench) and depth jumps (stepping off a bench and then springing off the floor and landing on a platform) are favourites of many trainers trying to help clients build explosive speed and a killer jump shot. But these drills can also hammer your joints – especially if you’re heavier than you should be.